Ten Questions For Mr. Macabre of The Final Unresting Place. I first came across the Final Unresting Place while watching episodes of Fearnets Route 666 Americas Best Home Haunts. Mr. Macabres haunt displayed a spooky playfulness reminiscent of the Haunted Mansion at Disneyland which is one of the reasons I myself grew into a HUGE Halloween fanatic. 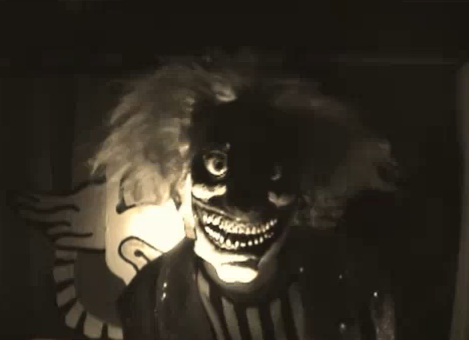 That playfulness accompanied by his many uniquely designed animated props mad me an instant fan of his haunt! I want to thank Mr. Macabre for taking the time to answer the following ten questions sharing with us his "Dead Time Stories!" 1. When did you first get into haunting, what inspired you? 2. When did you start making your own props and what was the first one you ever made? I started making my own props about in 1997 or so. I made a little static graveyard scene with some foam tombstones. I was so proud of them…until I realized that they couldn’t be seen at night and I had to address the issue of lighting. I made a funny scarecrow that hung from my flagpole and a couple of other little props that was cute but the first ‘official’ prop was Rachael, the flying crank ghost. She was my first. I still have the same harness for her but she’s gone through several facelifts and replacements since then. People still look at her in awe saying that she looks like ‘a real ghost’. 3. What inspired you to start making animated props? I basically started making animated props because I wanted to have movement in the Final Unresting Place Cemetery for authenticity. A ‘ghost’ is a ‘living’ being and being thus, it would therefore be in motion of some sort; it wouldn’t just be silent and frozen in place. To achieve that effect, the creations would have to move. I have been called by a close friend “a Hallowe’en snob” meaning I’m picky about the authenticity and scale of Hallowe’en props in my graveyard. I guess it’s a bit from my interior design background coupled with friends who were in theatre. 4. What prop that you have made was your biggest challenge and why? Were you happy with the outcome? OK, that’s a tough one. I guess that the biggest challenge of a prop so far has been the Axeworthy flying ghost system. It was a pain in the rear. By its very nature, it’s persnickety and when you’re building it on the fly, it’s all about trial and error, mostly error. I was fairly pleased with it…it got the job done but I would have liked to have made the ghost a little more distinctive. 5. What's your process for coming up with a new prop idea, where does it all begin? First, I gather a handload of twigs during the first new moon in the graveyard, then after placing them in a circle and lighting them, I sit in the middle with a knife made of bone and…oh, wait, that’s something else altogether. A lot of times I’m a copycat; I see a design for a prop and try to re-create it with my own twist upon it. Some ideas are taken from Disney’s Haunted Mansion, some are taken from other dark rides I’ve been on and some are from other haunters. Then there’s the ideas that I haven’t seen before as in Gentleman Jim, whose head rises to meet his hat. That is just plain ol’ inspiration or luck. Same thing with (hopefully) Pique A’Boux (peek a boo)-the bride that is now on the drawing board for 2011. As patrons walk past her she will be standing straight up with her veil down hiding her face, holding her bouquet of flowers. Suddenly her arms fly up lifting her veil and she bends forward revealing her face (which in this case will be comically ugly). 6. As haunters we usually try to create awesome works of haunt art with little to no money but what would be the one prop you would love to create if you had an unlimited budget to create it? I have an idea for a prop called The Dance Macabre that I think would be spectacular. Again, this is just raw inspiration…I was riding the Cave Train dark ride in Santa Cruz, California (a pseudo-Flintstones themed ride) and the last gag was the cave people dancing. The movement was very close to an inverted Scrambler ride and I started to think, would it not be cool for this effect to be with waltzing ghosts? They could be treated with glow paint to fade and reappear with the aid of black light as they danced around. THAT would be my dream prop! 7. Tricks of the Trade - Can you give us haunters one special tip or trick that has helped you out more than once in a build? Yes, my best advice is don’t underestimate! If you think that the motor can just do the job and you can get a stronger one, go for it. That thin piece of metal that saved you 2.00 off the thicker gauge is going to cost you time and money. Don’t skimp when you’re making something, you’re putting time money and your soul into this, make it count! Also…NEVER say I can’t, because it will be true. If you say I can, it will also be true. You CAN teach yourself how to cut and pop rivet metal. You CAN learn how to make a skull talk. You CAN build a fog chiller that can fill your yard with dense creeping fog. I didn’t say it would be easy or that there wouldn’t be some setbacks, do-overs and spurting blood along the way, just that you CAN do anything you set your mind to. 8. What advice would you give to a novice haunter who wants to start making his or her own animated props but might be scared to jump on in? Is there a good project you would suggest they start with? Of course I can say the boring tried and true, start small, yadda yadda yadda but unfortunately, it’s true. A VERY good project to start with is the Flying Crank Ghost in which there are tons of plans out there. This will give you the basics of movement for a prop (Gentleman Jim is simply an inverted Flying Crank Ghost mechanism with one wire). Then start to study how rotational motion is converted to linear motion. Get a wiper motor and adapter from Monsterguts.com and build something small like a waving arm to get your feet wet. Look at others’ websites and tutorials and see how they accomplished motion in their props. 9. What haunts out there either home or pro do you really admire and why? I think that my all-time favorite haunt that I have only seen on video is The Hallowed Haunting Grounds (http://hauntinggrounds.org/). I respect and admire anyone that decorates to any degree but I personally like a theme, meaning if you have a graveyard or a haunted house, why would there be a UFO crash there, an electrocution scene or anything that wouldn’t pertain to the supernatural? Again, my Hallowe’en snobbery showing through. Like Disney’s Haunted Mansion, there’s a theme (and some say a storyline but I personally have never gotten it) of ghosts and supernatural occurrences inside a house. 10. What's in store for the future of The Final Unresting Place? I really would like to see the Final Unresting Place grow first into a walk-through graveyard attraction (might give it a shot this year)and hopefully, someday, somehow, team up with someone and perhaps create a dark ride. It’s probably always going to continue to be a charity haunt, I loved the feeling of helping a worthy cause through the haunt, in my case, the Humane Society. Lastly, I have one or two pieces of advice that’s for novice haunters as well as more seasoned haunters…One: be yourself. It’s perfectly ok to emulate another’s style and borrow elements from another haunt (heck, I’m replicating the Haunted Mansion’s guy in the coffin this year and the hitchhiking ghost is a direct steal) but start to develop your own haunting style. If ‘Halloween Explosion’ is your style (ie: anything and everything in the yard whether it’s the same theme or not) then that’s great! You’re doing something you love and you’re doing it for Halloween. If you’re a die hard Hallowe’en snob that has to have everything perfect, then good for you! Somewhere in between? Excellent, just be yourself! You’ll have a lot more fun if you’re making your own little nightmare that you can call your own that is an extension of your personality. Secondly, help and share. Giving of your talents, knowledge and expertise to the haunting world is intrinsically rewarding and helps all of us further the cause of keeping Hallowe’en alive and well. That wraps up our interview with Mr. Macabre. we want to thank him for taking the time to answer our ten questions and share his "Dead Time Stories!" We hope you enjoyed it as much as we did. Stay Scary! 10 QUESTIONS WITH JOISEYGAL OF BLOODCREST MANOR. 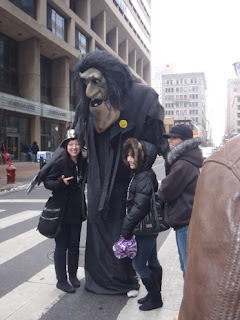 I meet Joisey when I first started posting on Hauntforum and was looking for local NJ Haunters. Joisey is a member of the NJ/PA Make and Take group which I started attending a few months ago. She is well known for her love of Great Stuff Foam and Great Zombie Makeup techniques and costumes. She is an avid participant in various zombie walks and parades and has won numerous awards for the awesome costumes she builds! 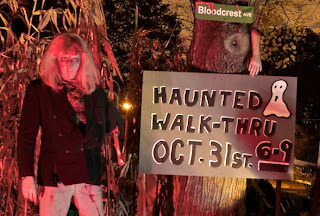 Just this past year Joisey took her Halloween yard display to the next level and jumped into the world of the Haunt Walkthrough. For any of us haunters out there who do a walkthrough we know what added pressures it can bring but Joisey took it all in stride and created a great first walkthrough to be proud of! Here is my interview with her which I want to thank her for in advance. It was a great read and a very informative one at that. If you are looking to take the next step to expand your haunt then Joisey has some wonderful tips and tricks that can help you do that and I cannot wait to see what she has in store for this year. Already she has some cool props in the works which she details all about on her YouTube page. So Lets get to it shall we! Interview number 3 of the Deadtime Stories with Joiseygal of Bloodcrest Manor! 1) Did you always love Halloween and Horror? I've always loved horror movies. When I was 9yrs. old I watched a movie called, "Mothers Day" and was intriqued by the gory scenes. I loved the special effects in movies especially getting results with make up. I've always wanted to pursuit a career in make up, but life took a different a path. Although I haven't become a profesional make up artist I get to express my creativity through making props and costumes. I would consider Halloween to be my creative outlet! 2) How and when did you first start getting into haunting? When I went to the Long Branch Haunted Mansion in 1980 I definitely wanted to get into the haunting industry. I was only 10 years old, but I knew scaring people is what I wanted to do. I just wish that the internet was available at that time because I would of definitely took advantage of the resources we have available today. The young generation that is interested in Halloween I would strongly recommend checking out the Halloween websites that are availiable. 3) When did the love for making your own props start? What was your first prop you ever made? That is a hard question because I can't recall the very first prop I made. I know about five years ago I enhanced a few store bought props that gave me the interest to make my own props. I think it was a spider victim that I used for the Scarecrow contest I entered at Williams Nursery. After the contest I displayed the prop in my yard. 4) I heard you are the queen of Great Stuff spray foam? Care to elaborate on that a bit? I love Great Stuff! I've made a 6ft. Instualted foam spider. I used it for my Crispy Critter ground breaker. I made a zombie victim with instulated foam guts and intestants coming out of the stomach. I use Great Stuff for Zombie costumes. I think Great Stuff is one of my favorite items to use for making props. The results are amazing and it doesn't take much effort. 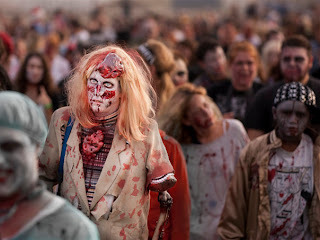 5) I see on your website Bloodcrest Manor you have entered a few contests like the Zombie Beauty Contest at the Asbury Park Zombie Walk and the Landi Comic Division at the Mummers Parade. The outfits look like they took a lot of time. Have you always been into making your own costumes and doing your own zombie makeup? Any zombie makeup tips and tricks? Eighteen years ago I marched in my first Halloween Parade which was the Toms River Halloween Parade. It is one of the largest parades on the east coast and I thought it was amazing. I altered a costume that actually came in the top five in a category I entered so that gave me the ambition to create my own original costumes for future parades. I've been marching in parades for the last eighteen years making my own costumes and applying my own make up. I usually procrastinate, so the costumes I make are done the week before the parade. As for tips I would suggest to check out Youtube videos on Make up like: anaarthur81, petrilude, etc. 6) This past year 2010 was your first ever walkthrough. What made you take that big step and what was the process like working on expanding your haunt like that? 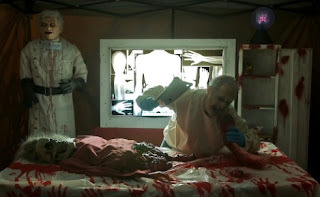 I did Halloween displays for three years before I wanted to expand to a Haunted Walkthrough in 2010. 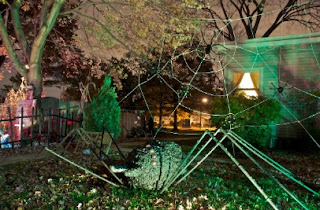 I worked for a professional Haunted House in October 2009 which was so much fun that I wanted to be able to do something similar in my yard. I also enjoyed listening to conversations and watching videos of other haunts that people had. As for the process of working on the haunt I started the second week of October setting up the front display and than continuing working through October to build the haunted walk through. A good friend of mine told me that once you go from display to haunt their is no turning back and to be honest I wouldn't want it any other way! 7) You recently started Haunt Vlogging. How has that experience been and what got you into doing it? Any advice for someone who wants to vlog but may be a bit scared to take that step into doing it? I have been watching the Bloodshed Brothers vlogs for almost a year now and HalloweenHellmouth for the past seven months and I have really enjoyed watching the day by day process of a Halloween enthusiast. The past six months I noticed more vloggers from the Halloween community including yourself Jay and that would be my subsitute for watching television programs. I think when I finally watched a girl vlog (Dionicia12) it gave me the convindence to start vlogging. I give the people that do daily vlogs a lot of credit because it is a lot of work, but I enjoy posting a vlog every other week to join in on the Halloween vlogging community. As for starting a vlog I would suggest just giving it a try if you love Halloween and want to express it through video. 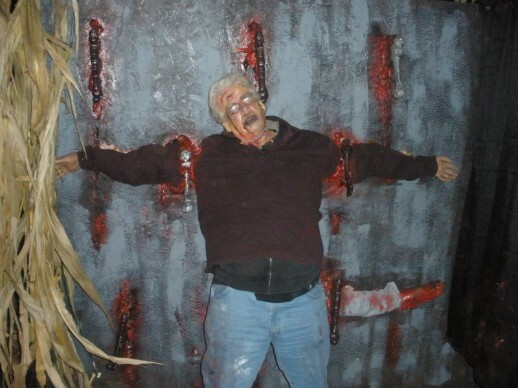 8) Any new props that you are working on for this years haunt? Any new sections your adding to the walkthrough? I am adding three new rooms to my haunt. I am going to have a hallway with pictures on the wall with a mirror drop panel. I am going to have a butcher room with a glass display refrigerator that will have an actor inside. (the refrigerator will have the back cut open for ventilation) I also was able to get a sink and a toilet, so I will be doing a bathroom scene. 9) If you had an unlimited budget to build the prop of your dreams what would it be? I think if I had a unlimited budget than it wouldn't be as fun anymore. I think the fun of making a prop is finding that reindeer motor on the side of the road or going to a yard sale and locating a shiatsu massager. I enjoy reading post on the Hauntforum of people that scored items to create props. I think one of my favorite props that I made is a prop that I entered for the $20 prop contest on the Hauntforum. 10) What does Joiseygal and Bloodcrest Manor have in store for us in the future and beyond?! Well I will be having a 100th subscriber contest for my Joiseygal Halloween Vlogs in the near future. http://www.youtube.com/user/Joiseygal?feature=mhum Also I will be changing rooms and expanding my haunt every year. Also I will be including pneumatic props in the near future because a good friend of mine gave me an air compressor. I hope you all enjoyed my interview with Joiseygal of Bloodcrest Manor. Please travel over to her webpage to see more video and picture of her haunt Bloodcrestmanor.com. And also subscribe to her on her YouTube. That wraps up this edition of The Deadtime Stories.